Play in the Christmas On Us at 9.30pm on 10th December for a chance to win a £150 in supermarket vouchers or [/b]£150 in real cash! Cards to the 75 ball bingo game are only 5p each. Win either of the following prizes: Widescreen LED TV, Kindle Fire HDX or a Digital Camera. Play Saturday 30th Nov, 7th Dec & 14th Dec @ 9pm in Xmas Presents room. Prizes up for grabs: FH: £250, 2L: £150, 1L: £100 on Christmas Day – Wednesday 25th Dec @ 9pm in £500 Xmas Pudding room. Accumulate points by collecting the Jingle Bell and Snowflake patterns in any room and making deposits of $50 or more from December 1st-23rd. The top-100 players with the most points automatically get a seat. Prizes: $25,000 Jackpot available in the Coverall pattern – min $250 $10,000 in prizes – guaranteed! The Christmas Day fun begins bonuses and gifts all day long under the tree in our $25,000 Christmas Day Room. Jump on the £250,000 Christmas Escalator Jackpots! There's at least £10,000 to win in the Guilty Pleasures room every day from 1st until 24th December. Santa’s Secret boxes are stuffed with cash just waiting to be won! To get your hands on the cash all you have to do is register for the promotion and make sure you complete the daily task. If you are the lucky winner you can pick one of Santa's Secret boxes! Everyone loves to spend the Christmas Holidays with family and friends. This year they want to make it extra special for players, take part in $13,000 Holiday Season Event and you and your family could have a truly magical Christmas. There is $13,000 in cash to be won in $13,000 Holiday Season Event, how would you spend it to make this Christmas one to remember? Open the windows to their daily offers! 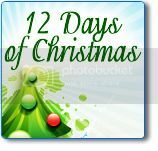 Come back every day to find special offers, prize giveaways and more behind every window in the Advent Calendar. Slip on your Xmas pants and be ready for some exciting sliding fun! Every day of the week there’s a different guaranteed jackpot to be won – grab up to a week’s worth of cards of the game so you don’t miss out. A sliding jackpot a day makes it Xmas every day! The £50k Winners Night will give you a Christmas to remember! On Sunday 15th December, they are giving away £50,000 worth of prizes in the ever-popular Gold Rush room! Join in the fun from 6pm to Midnight and take part in their roll on bingo games and x to go games. You can even try your hand in the last chance saloon for a chance to win big this Christmas! Countdown to 2014 with 31 days of exciting games and massive prizes! 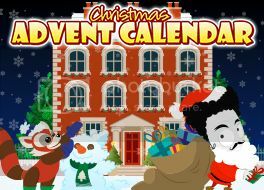 Take part in the Nutty Bingo Advent Calendar and win a special prize every day until December 31st! Get ready for Christmas with Amigo Bingo! Join them this Friday December 13th, 2013 in the Main Room. You could be the lucky winner of a $3,000 Jackpot just in time for Christmas! There is so much going on at Bingo Cams, you'd be mad to miss out! Christmas has come early this year at Bingocams because they have their very own advent calendar packed with presents for you to unwrap every day up until Christmas Day! - Go to Bingocams or their Facebook page from 8am daily. - Log in and enjoy! Santa knows how much you guys love your lucky dips! So join them at 12pm for their Santa's Sack £50 Extra Free Jackpot and 1pm for the Santa's Sack £75 Extra Free Jackpot where every full house winner will get to pick a dip and win a prize. Be careful not to pull out coal or oranges though, you don't get anything for these! You enjoyed the Rollover Games so much that they are back with a twist! Join them for Rudolphs Rollover where the jackpot starts at £1000 and goes up by £100 EVERY NIGHT! But here's the twist... It's their first ever 75 Ball Jackpot Room! Don't miss out! On Christmas Eve their own Angels will be granting 3 player wishes. Simply make a wish in your Live Win Moment between 16th and 23rd December then join them in their massive £1000 Big Present Jackpot room to find out if your wish has been granted! The Christmas at Cams promotion is packed full of 'Extra Free Jackpots'. This is an alternative term for their Guaranteed Jackpots. The bingo boffins were looking for the best way to describe their fantastic extras and since they give away their jackpots on top of the normal house prizes they thought they would keep it simple! So there we have it... All of their guaranteed jackpots are actually 'Extra Free Jackpots'. Exactly what it says on the tin. Keep your wishes realistic for the best chance to win - Our Angels aren't millionaires! $40,000 in CA$H and Prizes to be WON! There will be over $40,000 in guaranteed Cash and Prizes plus loads of BBs from the Chat Elfs. Holiday patterns will play in the 12 Days of Christmas room and pay jackpots between $100 and $200 every night from 6:00pm to 11:59pm. The cost per card will range from 25c - $1.00. In addition to the special Christmas patterns, each day one lucky player will get to select a present from their Magic Christmas Tree. Cash, Electronics, Jewelry and Mystery BBs are up for grabs! The Holiday festivities are well underway this Christmas and players are invited to join in the fun and games at Christmas Eve Bingo Party. The Christmas Eve Bingo Party will play throughout the evening from 6pm till Midnight ET on Tuesday December 24th in the festive Christmas Bingo Room. There's a warm festive welcome waiting for you in the Christmas Bingo Room this Christmas Day. Spend some time with your roomies as you play fantastic Christmas Day Max Games. These great games will play once an hour on Christmas patterns, starting at $150 but quickly rising to a maximum $500. Christmas is finally here and to celebrate 32Red Bingo are giving you a 100% BINGO BONUS on every deposit you make from now until midnight on Boxing Day. That's right, every deposit you make today, Christmas Day and Boxing Day will be doubled! Deposit £10 - Get £10 BBz Free - Play with £20! Deposit £25 - Get £25 BBz Free - Play with £50! Deposit £100 - Get £100 BBz Free - Play with £200! Have a great Christmas and good luck!